My name is Atish Baidya. I am currently the digital content editor at WOUB Public Media. My background is in television reporting. I was a television reporter for five years in Charleston, West Virginia, and then a year in Zanesville, Ohio. I have a bachelor's degree in broadcast journalism from the University of Southern California. (Baidya) A television news reporter's job is to tell a story, to report the news on a TV platform. Traditionally, that model has been you go out with a photographer to go and cover whatever story you've been assigned that day. You have to gather interviews. You have to gather B-roll-- footage of the event that's happening. Then you have to go back and edit those together. 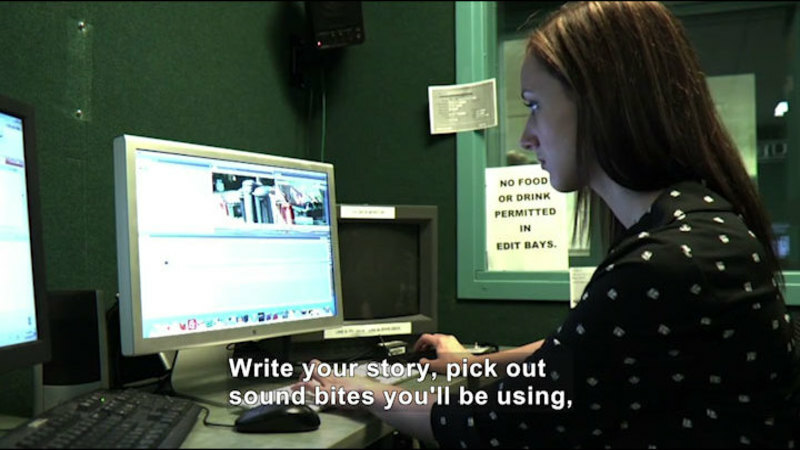 Write your story, pick out sound bites you'll be using, and put them together in a news package. It's called a news package because it's packaged together on one tape. It's a self-contained unit. (Describer) Video monitors show different views on a screen. Your responsibilities, you have lots of them. You have responsibility to your viewers. You have responsibility to your profession. You have standards that you have to abide by. You have to be ethical, fair, balanced, objective. So you have to make sure that you are getting all sides of the story-- that you're getting enough information to accurately and fairly convey the story that's happening, whatever it may be that you're assigned to. It's not a job. It's a lifestyle. It's sort of your essence of being, in some ways, and you either are working-- you're producing something from that or you're not. But you're infinitely curious, and you're always having to be observing and thinking. In high school, I did my high school newspaper and the high school yearbook, and I got involved in photography. I think photography was what really got me thinking about broadcast journalism. I took a photography class and I loved it. I just loved taking pictures. I took my newspaper class because it was something I always wanted to do. So how do I marry my love of the visual with my love of the story? TV news. You get to do both. But any experience you can have where you can practice the craft of doing journalism, telling the story, and having the visual element as well as the written element is what you should get involved in. If you've got a journalism class at your high school, like a school newspaper-- nowadays it's even online-- a school newspaper that's online-- or some schools do a TV newscast where they do morning announcements or present stories on a closed-circuit television type system-- if you have those classes and programs in your school, definitely get involved with those as soon as you can so that you're really building your ability to know what looks good visually and what looks good in terms of composition visually when you're doing photography or video, and then how to tell a story and how to write. You have to want to do it. Because Ohio has that urban and rural mix, you have smaller markets where you can get your start. So you can cut your teeth in the smaller markets and work up to bigger markets. You can stay in Ohio if you wanted to and build a great career working your way up from a smaller market to like a Columbus or a Cincinnati. So those opportunities are there. There's lots of news opportunities. Globally, I mean-- It depends on what you're interested in. If you work hard and you've got what it takes, and you're in the right place and know the right people, you can go work for CNN, or you can go work for... MSNBC, Fox News, all those big cable channels if you wanted to. Or AP or a wire service. That's the thing with news. It's almost like news doesn't have any boundaries or borders. Wherever you decide you want to go, if you set a goal, you can probably get there if you work hard enough. (Describer) Titles: For more information, visit OhioMeansJobs.com. Copyright 2014. Funding to purchase and make this educational program accessible was provided by the U.S. Department of Education. Contact the Department of Education by telephone at 1-800-USA-LEARN, or online at www.ed.gov. What elements go into creating a news package? For a career as a television reporter, studying broadcast journalism is key. Part of the "Career Connections" series.